Male Winter moth fits inside circle the size of a nickel. Females are just under a half-inch in length. In eastern Massachusetts the time to act is late November through early December, and then again late March through early April. An insect invasion has plagued eastern Massachusetts for the past 10-15 years. 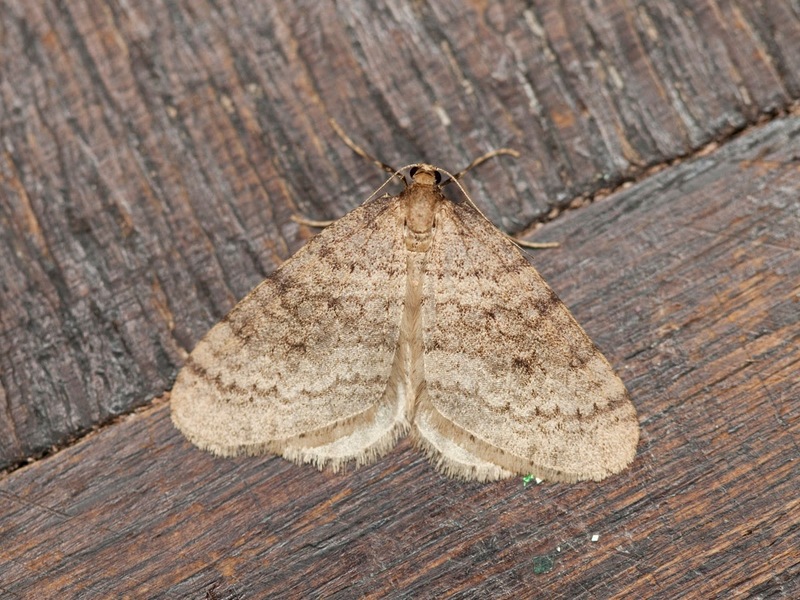 Winter moths, native to northern Europe, reached parts of Canada in the 1930s. The introduction was accidental. The problem is monumental. Visual evidence of how bad it is will be upon us shortly, as the male moths, looking much like like tan-to-brown shaded triangles, are strongly attracted to outdoor lights. There will come evenings in late November or early December when upon arriving home, you may see scores of moths gathered round the light over your front door. The "winter" part of the name refers to an evolutionary strategy used to avoid predation. Most insect eaters (birds, bats, spiders, wasps and other insects) are active during warmer months. Winter moths shift the active parts of their life cycle into the colder months. Eggs are laid in late November and December and hatch in late March. The tiny hatchlings eat the beginning-to-open flower and leaf buds from the inside out. By May, caterpillars are full sized, and descend to the ground where they transform into pupae, hidden in leaf litter. Pupae stay dormant until after the first frosts of November. The emerging adults, freeze-resistant thanks to anti-freeze compounds such as glycerol, use their short lives to procreate before dying. Winter moths have an interesting dimorphism. Males have strong flight muscles, with an ability to pre-warm these muscles through shivering before cold weather flight. In contrast, females have only vestigial wings. Sacrificing flight capacity allows more than fifty percent of their adult body weight to be given over to eggs. Mating is achieved after the females climb up tree trunks and then release scent pheromones into the air. Males fly to them. Winter moth larvae are generalists, but especially like fruit trees, maple, ash and birch trees, and blueberry bushes. Flower bud damage leads to low fruit and berry yield. Leaf loss can be so great that too many years in a row will kill trees, especially if dry conditions prevail during the time the trees are putting out replacement leaves. Treatment involves putting sticky products such as Tree Tanglefoot around tree trunks in November and then spraying a few times in early spring with dormant oil or other insecticides. There are organic treatments for those who do not want to use chemical pesticides. 11/14/14 update: After a few night frosts, moths are beginning to appear in Maynard. 11/26/14 update: My big birch tree has more than 500 males and females stuck in goo! 12/15/14 update: No new sightings, so removed plastic wrap. on plastic wrap, not directly on tree. See photo below for results. This is not the first time an invasive moth has had such a massive impact in the Northeast. European Gypsy moths were deliberately brought to the United States - specifically, Medford, MA - by Etienne Leopold Trouvelot, in the 1860s. As an amateur entomologist, Trouvelot was experimenting with Gypsy moths as a means of establishing silk manufacture in the Americas. He failed. Moths escaped. Gypsy moths occupy a different portion of the calendar than winter moths. Eggs laid in August hatch the following May. The rest of the life cycle is compressed into a few months. Nearly 140 years later, this pest's territory is still expanding westward and southward, although a number of introduced biological controls, including parasitic insects, have blunted severity of the outbreaks. to pheromones released by females. "Ecological release" refers to situations in which a species undergoes massive population expansion, due mostly to lack of predators, parasites and diseases. The best known examples are for species introduced from one continent to another, but can also occur when apex predator species are removed from the top of the food chain (think whitetail deer without wolves or mountain lions, and not enough human hunters). For invasives, the resultant population expansion from point of entry is fast for species with high mobility, slow for creepy crawlers. These two moth species are examples of slow expansion because females are unable to fly. Egg laying occurs on or near the tree they grew up on. Dispersion is achieved be a few methods. Post-hatch caterpillars can release a silk strand from the abdomen, then unclasp from the twig and allow wind to blow them to a new location. This means of travel is better known for young spiders, and called 'ballooning.' Older caterpillars can descend to the ground and explore, one tiny footstep at a time. Either way, the failure rate is high, but enough succeed that territory continues to enlarge, and areas that are sprayed with pesticides will re-infest over time. 2015, and my birch trees' infestation was even worse. This year I got the goop on the tree by mid-November. Trapped so many that I had to remove it and reapply fresh wrap and goop on Thanksgiving, and then again December 1st. Will see come spring how much this slaughter benefited the trees. Biological control has proved successful in Canada - not clear if this method has yet been introduced to U.S. There are two insect species (a fly and a wasp) that specialize in winter moths. Their larvae consume the winter moth caterpillars from the inside. 2016: Less severe, and more males than females. That suggests I am getting my own local females and males, but additionally attracting males from the neighborhood. If this repeats in 2017, suggests that it is not necessary to wrap every tree, as wrapping only some trees will remove males from the mating equation. However, this is a strategy that works if males mate only once. 11/26/2014 - my house in Chelmsford is flooded with them. It's like a big cloud. I go out after dark, hunt the females and kill them. They did a job on my trees last year. The good news is that they are easy to find and there are far few of them compared to the males. I'm guessing a ratio something like 75-100 males to one female. The males make locating females simple. Over the past three nights I've killed some 75+ females. At an average of 150 eggs per female, that's some 11,000 caterpillars that won't be chewing the trees in the Spring. I'll be out every night hunting until the invasion is over. Anon - I think you method is missing the females. I put Tree Tanglefoot on a large birch tree that was badly chewed up last spring. So far, about 500 each of males and females!!! Because the tree trunk is white I can actually see the females walking up from the ground. do these moths come indoors? We suddenly are seeing them nightly in our bedroom. Attracted to light, so if window open, yes, the males will fly in. Other possibility is that you are harboring an infestation of wool moths. These are smaller, with white wings. And tend to be seen near wool clothing in closets.